In my case, the lighting that I had was more than suitable therefore there was no rush and I also wasn’t particularly enamoured with this idea that energy efficient LED lighting took an age to reach any real ‘brightness’; I quite like the idea of flicking a switch and being able to see what I’m doing immediately. Also, I was very mindful of the costs of LEDs compared to traditional incandescent lighting and the prospect of an additional mortgage for new lighting was not that inviting. However, following an invite and challenge by LED Hut my mind was refocused to revisit this rapidly advancing technology to see if some of my preconceptions held true. 8 candle lights type bulbs over 2 chandeliers 8 x 50 watts = 400 watt. 5 spot lights 5 x 50 watts = 250 watt. 8 candle lights type bulbs over 2 chandeliers 8 x 3 watts = 24 watt. 5 spot lights 5 x 5 watts = 25 watt. It is comparing these numbers that helps you see the long term energy savings and are quite stark; turning on all the lights in my kitchen diner now uses 62 watts compared to 710 watts, which is less than 10% of the original power consumption. There are two widely available options in relation to colour; cool white and warm white. When looking at the two on the internet I was convinced cool white would give me the brightness I was after. The lights were ordered and arrived in double quick time, however, a little bit to my disappointment, the cool white just wasn’t for me, it gave great coverage but for me it is a very white, white and quite’ clinical’ and a little bit ‘crisp’ looking for the rooms I was to use them in. Realising I’d ordered the wrong lighting I returned them and re-ordered replacements in warm white. When the replacements arrived I was really pleased, the difference in colour is quite distinct and something to bear in mind. The warm white is much softer and really does radiate more warmth than the cool white and probably nearer to the colour of the traditional bulbs I was replacing. We do have an old energy efficient light in one room which we rarely use (probably due to the light up time!! ), which does seem to take 20-30 secs to become fully lit. The new LED lights dispelled the previous concern of a time delay; there really is no waiting around, when I flick the switch I get immediate, fantastic lighting much to my surprise and of no difference to other non LED bulbs we have in the house. 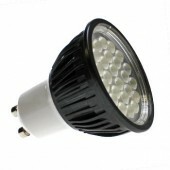 The other difference in relation to the type of light with LED bulbs is the coverage and how the light is output. With the majority of LED lights no difference can be seen though with spotlights the focused beam of light you are used to with traditional spotlights (GU10’s) is not there and the light is more dispersed and the light coverage is more widespread than areas of highlighted areas. This does give a difference but one after a few days becomes un-noticeable. I have heard arguments that cooks like a beam of light from spotlights when chopping or performing certain cooking tasks though I fail to see how these could not be done to the same standard with the difference experienced. When the bulbs arrived in the standard jiffy bag I was initially a little bit surprised by the packaging, it was uncomplicated simple white boxes with a protective white insert to protect the LED bulb. However, when the bulbs were examined it was clear to see where the money had been spent. It’s refreshing that this is the case and the focus has been on a good looking well-built product, instead of flashy packaging with poor quality inside. 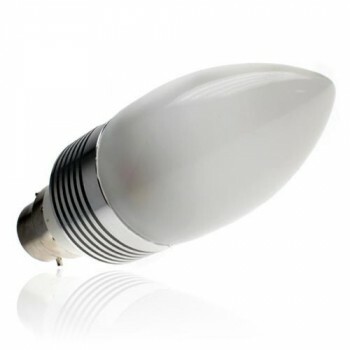 The bulbs are a good quality unit which are attractive in their own right; when each of the replacements were placed side by side with the old versions both these points were easy to see. The chandelier lights (candle light LED bulbs) are quite impressive and really good looking, they’re nothing like the traditional candle bulb that you may have in your head, they’re smart and stylish and have given my chandelier a completely new look. The spotlight replacements were a much more solid sturdy fitting than original that inspires confidence that they will last the estimated 50,0000 hours they are meant to last. Obviously, quality will vary from supplier to supplier and most I imagine will be manufactured abroad with China having a big slice of this market. It really is an easy install and anyone who is capable of reaching the bulbs should be able to carry out the LED switchover for the majority of bulbs. It is simply a case of removing the old and replacing with the new. They didn’t require any alternation to fittings or adaptations so it really was a straightforward swap. The LED strip lights are slightly more involved and do require a transformer and small changes to the existing fittings. A competent DIYer am sure would be capable of doing what is required, but am not so will be asking a trained electrician to check and install. Cost varies in LED bulbs as with most things and I have seen them for sale in some of the big DIY sheds for £20+. Whilst changing over all the lights in your house in one go may require quite a capital type expense, changing a room over to LED lighting per month or every other month should be more achievable. Having made the switch I really do feel like it was the right choice, now a little wiser I can really see why LEDs make a difference. Take for example the lifespan of LEDs which have the potential to give you over 50,000 hours of lighting, compared to incandescent lighting that’s 10-20 times longer, so, think about that in terms of replacement and landfill, what a great saving! LEDs are unbelievably energy efficient, compared to incandescent lighting the 80 / 20 split really has been turned on its head, Traditional lighting lost 80% of its energy to heat leaving a mere 20% for lighting. So in effect a bulb which we wanted light from ended up using more energy in heat than light. LEDs on the other hand do the complete opposite, they lose a mere 20%of their energy to heat loss leaving a whopping 80 % for lighting, in my opinion this takes energy efficiency to a whole new level. Many of the ‘old’ myths and beliefs are just no longer true with energy efficient lighting. Maybe it is time for your LED switchover and we would extend our initial challenge to try LED bulbs to you; we would love to hear your thoughts below and on our forum here. Finally, thanks to LED Hut for supplying the bulbs to review and if you are interested in us reviewing your products feel free to get in touch. Good piece, but no mention of the need to recycle any CFLs the LEDs may be replacing! We’ve installed over 800 CFL recycling bins across the UK in the last 2 years, making it easier for households to recycle.